Many factors determine the type of paint that you should use on any given paint job, including the nature of the surface you want to paint and its condition, the age of the surface, and the type of paint previously used on the surface, if any. These names refer to one of the major differences between the two types of coatings – most of the liquid portion of latex paints is water, while the liquid in oil-based paints consists of petroleum distillates and other organic solvents. About 75% of all the paint that is sold today is of the latex variety. Do-it-yourselfers use an even higher percentage of this type of paint for both exterior and interior projects. But you should take nothing for granted when painting your home. 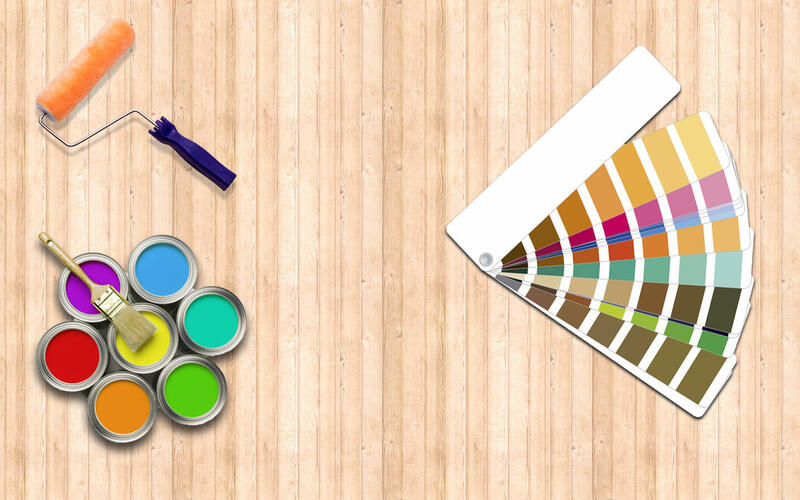 You must consider the nature of your particular job to decide which type of paint is best for your application. Water-based latex paints have always been popular with do-it-yourselfers and professional painters because of their easy cleanup with plain soap and water. But today’s quality latex paints offer significant performance advantages as well. Compared to oil-based paints, top quality exterior latex paints have greater durability in the form of better color retention and chalk resistance, so they continue to look good for years. Since they do not tend to get brittle as oil-based paints do, they have better resistance to cracking. Latex paints also dry much faster than oil-based paints (typically in one to six hours), which allows you to quickly apply a second coat. Quality latex paints that have “100% acrylic” binders are especially durable and highly flexible. They tend to adhere extremely well to a variety of exterior surfaces, which means they have greater resistance to troublesome paint failures like blistering, flaking and peeling, compared with other latex paints. California Paints offers a complete line of 100% acrylic latex paint. You can also use quality latex paints on interior trim. They have better resistance to chipping than do oil-based paints, which continue to harden over time and eventually become brittle. Top quality oil-based paints have excellent adhesion characteristics, which means they get a tight grip on the surface being painted. And good adhesion is essential for a durable paint job. However, oil-based coatings do tend to oxidize and get brittle over time, which can lead to cracking problems in exterior applications, and yellowing and chipping problems in interior applications. There are also circumstances in which you should never apply oil-based or alkyd paints. For example, they should not be applied directly to fresh masonry, nor to galvanized iron. In either case, the result will probably be a very quick failure of the paint. If you decide to use oil-based coatings, be aware that they are more difficult to apply and clean up after than latex paints. They also take longer to dry – sometimes, 24 hours or more – so you cannot apply a second coat as quickly as you can with latex paint. Oil-based paints can be used for certain applications within the home – for example, on interior trim. But keep in mind that these paints have noticeably more odor than latex paints. That, combined with the slow dry time, may put your rooms out of service for a short while. If you use oil-based paints, you will also have to use paint thinner to clean up drips and equipment, which means that you must use extra care in handling and disposing of rags. Durability Excellent adhesion; better adhesion than latex on heavily chalked surfaces Excellent adhesion to most substrates; better elasticity than oil. Color Retention Not as good as latex; more likely to chalk and fade in sunny exposure. Superior resistance to chalking and fading, especially when exposed to bright sun. Ease of Application More difficult to apply due to greater “drag,” but goes on heavier for better one-coat hiding and coverage. Goes on smoothly and evenly, with less brush drag. Mildew Resistance Vegetable oil base can provide nutrients for mildew growth; most products contain mildewcide to minimize growth. Less inherent tendency to grow mildew; mildewcide additives discourage mildew growth, help maintain fresh appearance. Odor Noticeably more odor than latex. Very little odor. Clean Up Turpentine, paint thinner or other solvent. Simple water cleanup. Drying Time Eight to 24 hours. One to six hours, permitting quick recoating. Selecting the ideal sheen or gloss level for an interior or exterior paint job involves both aesthetic and practical considerations. From an aesthetic standpoint, a degree of sheen or gloss is useful in creating visual interest, particularly indoors. From a practical standpoint, the right sheen or gloss can help extend the life of the paint job, whether it be an interior or exterior application. California Paints products are available in a variety of sheens, so you will be sure to find one suitable for your painting project. Consult the sheen guide below for helpful descriptions on all California Paints sheen levels.